Expanding our powder room to include a shower is at the top of my home-project list. 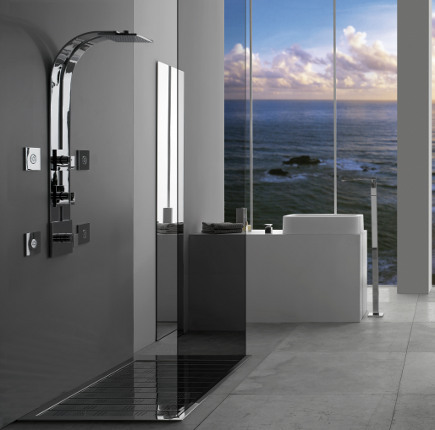 I’ve been brushing up on my shower research and was happy to discover that shower systems are getting more adventurous. Still, the two long standing types of controls — pressure balance valve and thermostatic mixing valve — continue to be used. So once I decide which system to shop for it’s easier to choose among the dazzling number of shower system choices available today. The shower is a very expensive purchase and in-the-wall plumbing sets it in cement, so to speak. Right now, I’m considering systems from Graff, a top-rated brand, founded in 1922 in Wisconsin. The Graff contemporary Ski Shower [above] is an ultra-fashionable surface-mounted fixture that’s highly adjustable and definitely a statement-maker. But the market is huge and there is a wide variety of styles, brands, price points and features to explore in order to find a shower with great function and looks. The most familiar shower system is based on a pressure balance valve. The lever swivels to regulate water from cold to hot and adjusts the variations in water pressure automatically. A pressure balance control is the most economical of the two systems. It’s basic components are the on/off valve and the shower head. But it can become more luxurious by adding on a separate hand shower accessory and/or body sprays and, of course, a tub-filler spout, if needed. The pressure balance valve itself has a long history. It was invented in 1939 by Symmons Industries. 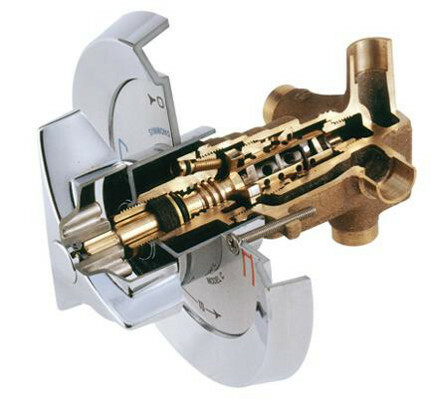 This cutaway shows the intricacy of the guts which are usually brass or stainless steel. Brass is a copper and zinc alloy combined with other metals and the copper in brass is said to be anti-microbial. Brass is resistant to corrosion (inside) and takes chrome and other exterior plating finishes very well. This more advanced system is based on an temperature control that operates independently from the on/off operation. These systems can be complex because each component has its own control. We often see thermostatic system levers lined up, which can look confusing at first. Usually the thermostatic control is the largest valve, as it is on Luna system, and regulates only the water temperature. It can be preset for all the components. Water flow from the shower head has its own control valve 9top0. And, the hand shower –a feature I feel is a must, budget permitting — operates independently with it’s own on/off control [center]. Our master bath has a thermostatic mixer and our guest bath has a pressure balance shower. Having had great experience with each type, I prefer the thermostatic mixer because it allows me to regulate both the temperature and intensity of that shower. But the pressure balance shower is great, too, just not quite as adjustable. I put a hand shower in each of our baths and I use them frequently so I believe a hand shower is well worth the cost. Sometimes called a “telephone” the hand shower head connects to the water supply via a flexible hose or tube. It can rest on a fixed bracket or adjustable slider bar. The hand shower lets me to do a quick wash down, sit down to shower off, or wash my hair quickly. It’s incredibly useful if there are little ones and pets in the house and it’s great for cleaning out the tub. In our master bath, I made sure I could reach the hand shower as well as the separate lever that operates it when I was seated on the shower bench. 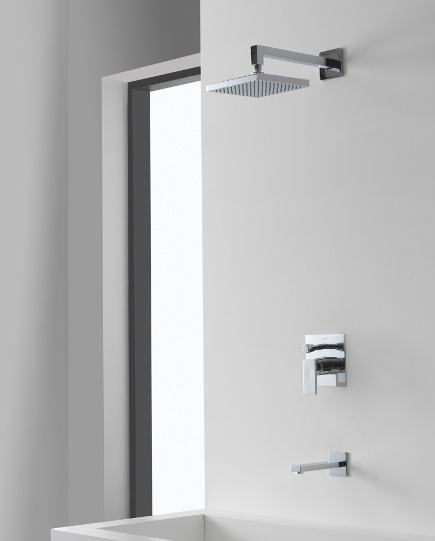 As a rule of thumb, shower controls (including hand showers) are located between 38” and 48” from the floor and they are usually centered below the shower head or offset. Additionally, body spray jets can be added and separately controlled. There are a wide variety of styles, shapes and spray pattern effects. Rain shower heads can be mounted on a ceiling so that water comes straight down when you step under it. I like a wall-mounted shower head which can be adjusted as I don’t always want to wet my hair. I’ve been looking at Graff’s square style [above] which is broad but can be angled. Before purchasing any shower head, it’s important to check the flow rate. By government regulation in the U.S., the maximum flow rate is 2.5 gallons per minute at a standardized pressure of 80 pounds per square inch. Some shower heads have water-saving restrictors which reduce the flow (and can make for a slightly wimpy shower). I like to visit a showroom and see how water moves through the shower head I’m considering though this information is now often available online via videos. 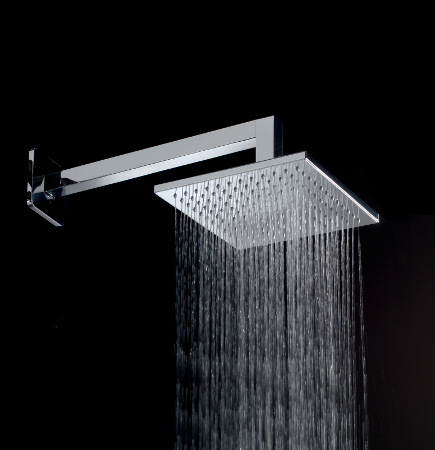 As a rule of thumb, a shower head is located on the wall between 66” to 81” above the finished shower floor. 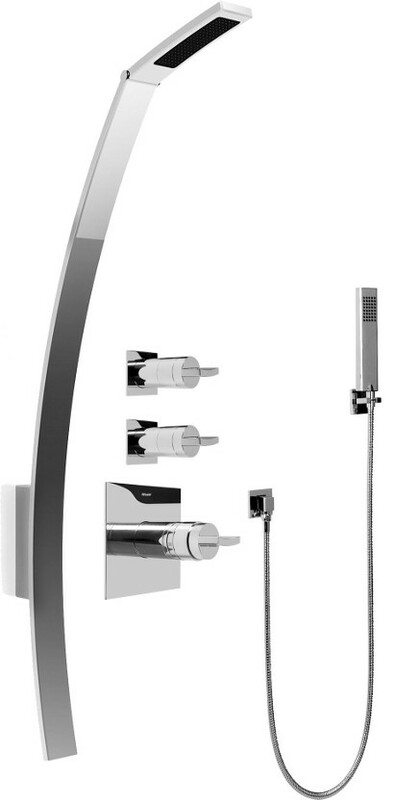 Many people ignore the basics and choose a shower system based on the look of the shower head, lever and hand-shower. Manufacturers present collections and there can be a surprising number of handle and component styles to choose from. That’s great but it’s always important to determine which one will be most comfortable to turn and adjust with wet, soapy hands. In general, square shapes tend to look more modern than rounded shapes and surface-mounted systems require a bit more wiping down than in-wall systems. Chrome, nickel and stainless steel are popular finish materials which can be polished or brushed. Chrome and stainless do not tarnish while nickel requires the use of a metal cleaner. I don’t favor specialty finishes for the shower they are available for anyone who prefers them. When shopping, I carefully note the full style number of each shower system component and pay special attention to any suffixes with letters and numbers that determine the finish. I always check and double check those numbers to be sure I won’t have any surprises when I’m ready to order. Most local building codes require a 30” x 30” minimum space for a free-standing shower while many experts recommend at least 36” x 36.” But in any space, a 30-inch diameter circle must fit on the shower floor to allow enough room to move around. And the shower head must extend into the circle. These days, I start shopping on a website like Décor Planet, a modern bathroom fixture specialist I like. My process is to start shopping online, then go to see the style and finish in person, then search for the best deal before buying. And before ordering any fixture, I always call the website or source to be sure the item is in stock or find out how long it will take to arrive. 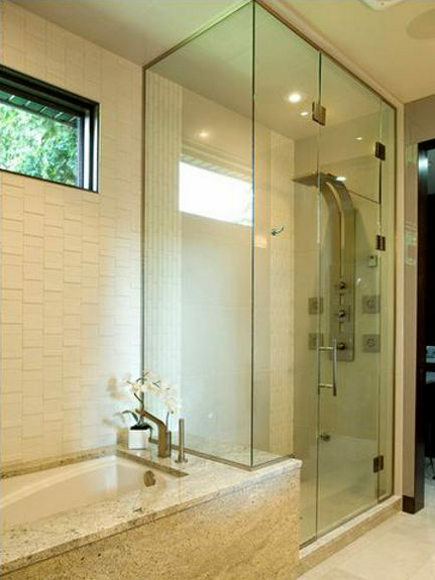 When it comes to choosing a shower system, those critical details count!